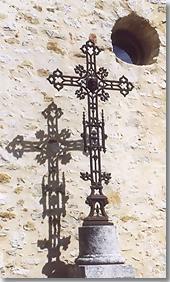 From Forcalquier, follow the direction of St. Etienne Les Orgues, then take the D951 in the direction of Banon. 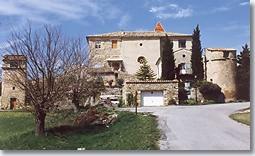 Ongles is a small, sprawling village at the foot of the "Montagne de Lure". It is unusual as it is comprised of 8 separate hamlets: les Granges, les Valettes, les Verdets, le Rocher d'Ongles, les Rouvières, Saint-Sargues, Fontaine and les Ganas. Some isolated farms are scattered around the beautiful countryside surrounding the settlements. While walking in Ongles, you will discover the village square and 17th century restored chateau, complete with beautiful gargoyles. The pretty tiles of the church bell-tower can be seen nearby. You can then climb up to Vière, the primitive site of the medieval village of Ongles. On the way up you will pass the 14th century communal washing area before discovering the village ruins and a Roman church. Outside the village, don't miss the Rocher d'Ongles hamlet above the Laye valley. Litterally perched on a rock, it's a picturesque and surprising sight ! Ruins of Vière: site of the primitive village. Self-catering rural holiday accommodation (gîtes). Lardiers (5km), Saint Etienne Les Orgues (5km), Limans (6km) and Forcalquier (14km).